Btooom! (Japanese: ブトゥーム!, Hepburn: Butūmu!) is a Japanese manga series written and illustrated by Junya Inoue. It has been serialized in Weekly Comic Bunch since 2009 and later in Monthly Comic Bunch, with chapters collected into 26 tankōbon volumes as of 2018[update]. Btooom! follows the adventures of Ryōta Sakamoto, an unemployed and isolated young man who is one of the world's top players in the titular video game. After Ryōta is nominated to participate in the real-life version of the game, he becomes trapped inside it and meets his love interest Himiko, who was his in-game wife. With the help of their fellow players, Ryōta and Himiko must find a way to return to the real world. An anime adaptation covering the first 50 chapters of the manga was produced by Madhouse and aired in Japan on Tokyo MX from October 4 to December 20, 2012 and was streamed with English subtitles by Crunchyroll. The manga series was licensed for an English-language release in North America by Yen Press. The anime series has been licensed by Sentai Filmworks for an English-language release in North America. Ryōta Sakamoto is an unemployed 22-year-old young man who lives with his mother Yukie. He is one of the world's top players of the combat video game called Btooom! One day, he awakes in what appears to be a tropical island, though he does not remember how or why he has been transported there. While wandering around, Ryōta sees someone and calls out for help. The stranger responds by throwing a bomb at him. Ryōta soon realizes that his life is in danger and that he has somehow been trapped in a real-life version of his favorite game. In the game Ryōta meets Himiko, who is another Btooom! player — and Ryōta's in-game wife. As the series progress during Iida's investigation with the government agents like Matthew Percier, along with the help from Ryōta's step-father and step-uncle Hisanobu and Mitamura, it is revealed that Tyrannos Japan, the developer of Btoom! has been associated with the terrorist organization called Schwaritz Foundation, in attempt to use the players as their test subject to conquer entire world and getting rid of the evidence of their exposed crimes they are currently committing. It also contains two endings on Chapter 121 separately, Good and Bad Endings. Himiko is a high school girl who is also Btooom! player and was Ryōta's in-game wife, though they did not notice this at first. Her real name is Emilia. Kōsuke Kira is one of the Btooom! players. He is believed to be a three-star player in the world of Btooom!. Oda is portrayed to be one of the most dangerous Btooom! players. He was once Ryota's friend back in high school, until a recent incident caused them to be expelled. Ken'ya Uesugi is one of the Btooom! players. Kaguya is one of the Btooom! players. Masashi was a Btooom! player and a war veteran. Masahito was a doctor who worked at the same hospital as Shiki Murasaki. Kiyoshi is one of the Btooom! players who speaks in the Kansai dialect. Hidemi is a selfish and frivolous Btooom! player who joins forces with Nobutaka until he abandons her. Sōichi has a large forehead and a fair amount of wrinkles. Yoshihisa was one of the Btooom! players and the father of Kōsuke Kira who he abused, only to be killed by his son. A player from the previous round of Btooom!, a year and a half prior to the start of the series and a former associate of Masahito. Kondō is one of the Btooom! players who constantly spoke his mind and argued with Masashi Miyamoto. A former senpai of Ryōta's who works in Tyrannos Japan. A young man Himiko knew and trusted. He was part of a band and convinced Himiko to introduce her friends to them. Formerly the best friend of Himiko. Formerly a friend of Himiko. A government agent who helps Ryota to expose the dark secret behind Tyrannos Japan's Btooom! "beta test", then led an operation to rescue him along with other remaining Btooom! survivors on behalf of Iida and Hisanobu. Junya Inoue began publishing Btooom! in Shinchosha's Weekly Comic Bunch in 2009. In 2011 the manga was moved to the new Monthly Comic @ Bunch magazine, which launched on January 21, 2011, after Weekly Comic Bunch ceased publication on August 27, 2010. It was announced in the May 2014 issue of Monthly Comic @ Bunch, released on March 20, that the manga would enter its final arc in the June issue, released on April 21, 2014. Inoue revealed on Twitter that the series will end with the release of its 26th volume, publishing its final chapter in the May issue of Bunch in March 2018. In an unusual twist, the author is also planning on making his finale special by having two unique endings, providing "the dark" and "the light" versions of its ending, so that the readers will be able to choose what protagonist Ryota Sakamoto will do at a pivotal point in the manga's story. The series is published in tankōbon form by Shinchosha, and has been licensed for release in North America by Yen Press, who began releasing it in spring 2013. With the BTOOOM! 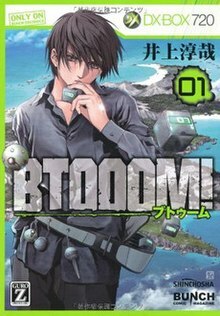 manga ending in 2018, a new BTOOOM! manga spinoff called BTOOOM! U-18 was announced in February 2018. The manga spinoff will be written by Yuya Kanzaki, who is known for Ouroboros and Impossibility Defense (Funouhan). The name U-18 could potentially mean a real-world reference to a German submarine that was sold back in 2011. The new manga will be a prequel or prologue to the main story and will launch in the same magazine issue that features the original manga's light ending. The series has been collected into twenty-six tankōbon volumes as of February 2018. Twenty-two volumes have been republished in English, with the twenty-third volume due to be published in January 2019. The final chapter was released on March 20, 2018, and the final volume was released on August 9, 2018. In June 2012, it was announced that the manga will be adapted into an anime television series by Madhouse, director Kotono Watanabe, and scriptwriter Yōsuke Kuroda. The 12-episode series premiered in Japan on Tokyo MX from October 4 to December 20, 2012 and was streamed with English subtitles by Crunchyroll in North America, UK, Ireland, Australia, New Zealand, Scandinavia, the Netherlands and South Africa. The anime has been licensed for a 2013 home video release by Sentai Filmworks in North America. The opening theme song is "No pain, No game" by Nano and the closing theme song is "Aozora" (アオゾラ) by May'n. The anime covers the first 50 chapters of the manga (up to Volume 9). In late February 2017 the BTOOOM! game produced by Masato Hayashi was launched and immediately shot to the top of the charts for free game apps. Despite early success, the game stayed in Japan's top five only for several weeks, and by April 2017 Goboiano reported that the app had “fallen below the top 50”. The game was last updated in July 2017 and never received an English port for Android and iOS/iPhone. Also called Btooom Online, originally developed in 2016, it was a battle royale game, predating PlayerUnknown's Battlegrounds and Fortnite. The original BTOOOM! manga itself also features a fictional battle royale video game. The manga was in turn inspired by the 2000 Japanese film Battle Royale. Theron Martin from ANN reviewed the first few episodes by making comparisons with Sword Art Online which has similar plot theme but differs in style and takes a "darker, grittier, and entirely more visceral approach" as well as displaying combat "ingenuity" rather than SAO's "powermongering approach". Despite the similarities, Btooom! has fairly typical weaponry that produces "a novel twist which dramatically shapes the strategic moves of the players in interesting ways" and the character choices that sway the audience's impressions of them. Overall, he praised the consistency of thrilling action scenes, the efforts on developing the protagonist and its effective dramatic, intense moments. Even though the anime series became popular internationally, the BTOOOM! Blu-ray/DVD discs only sold 338 copies in Japan. ^ a b c "Sentai Filmworks Adds BToom! Survival Action Anime". Anime News Network. Retrieved 30 September 2012. ^ a b "Crunchyroll to Stream BTOOOM! Survival Action Anime". Anime News Network. 2012-10-02. Retrieved 2013-06-15. ^ a b "Junya Inoue's Btooom! Manga Will End With 26th Volume". Anime News Network. Retrieved 2018-02-23. ^ a b c "Madhouse Makes TV Anime of Btooom! Survival Action Manga (Updated)". Anime News Network. June 6, 2012. Retrieved July 6, 2012. ^ "Monthly Comic Zenon to Succeed Comic Bunch Manga Mag (Updated)". Anime News Network. October 12, 2010. Retrieved August 18, 2015. ^ "Comic Bunch, Comic Yuri Hime S Mags to End Publication". Anime News Network. June 18, 2010. Retrieved August 18, 2015. ^ "Junya Inoue's Btooom! Manga Enters Final Arc". Anime News Network. March 20, 2014. Retrieved August 18, 2015. ^ "Junya Inoue's Btooom! Manga Will End With 26th Volume". Anime News Network. September 9, 2017. Retrieved September 9, 2017. ^ "Junya Inoue's Btooom! Manga Ends in 4 Chapters". Anime News Network. December 21, 2017. Retrieved December 21, 2017. ^ a b c d e f "'BTOOOM!' Season 2: Manga Ending Has Two Versions, Spinoff 'BTOOOM! U-18' A Prequel – Anime Sequel Possible?". The Inquisitr. 2018-02-23. Retrieved 2018-02-23. ^ "Yen Press Adds 'Another' Horror Novel & Manga, Junya Inoue's BTOOOM! Manga". Anime News Network. July 13, 2012. Retrieved August 18, 2015. ^ a b "Yuya Kanzaki's New Series Revealed to Be BTOOOM! Spin-off | MANGA.TOKYO". MANGA.TOKYO. 2018-02-22. Retrieved 2018-02-23. ^ 著書一覧：井上淳哉. Shinchosha (in Japanese). Archived from the original on October 3, 2015. Retrieved September 19, 2015. ^ "BTOOOM! by Junya Inoue". Yen Press. Retrieved August 18, 2015. ^ "BTOOOM！　1巻". Shinchosha (in Japanese). Archived from the original on August 14, 2015. Retrieved August 18, 2015. ^ "BTOOOM!, Vol. 1". Hachette Book Group. Retrieved December 21, 2017. ^ "BTOOOM！　2巻". Shinchosha (in Japanese). Archived from the original on August 14, 2015. Retrieved August 18, 2015. ^ "BTOOOM!, Vol. 2". Hachette Book Group. Retrieved December 21, 2017. ^ "BTOOOM！　3巻". Shinchosha (in Japanese). Archived from the original on August 14, 2015. Retrieved August 18, 2015. ^ "BTOOOM!, Vol. 3". Hachette Book Group. Retrieved December 21, 2017. ^ "BTOOOM！　4巻". Shinchosha (in Japanese). Archived from the original on August 14, 2015. Retrieved August 18, 2015. ^ "BTOOOM!, Vol. 4". Hachette Book Group. Retrieved December 21, 2017. ^ "BTOOOM！　5巻". Shinchosha (in Japanese). Archived from the original on August 3, 2015. Retrieved August 18, 2015. ^ "BTOOOM!, Vol. 5". Hachette Book Group. Retrieved December 21, 2017. ^ "BTOOOM！　6巻". Shinchosha (in Japanese). Archived from the original on August 14, 2015. Retrieved August 18, 2015. ^ "BTOOOM!, Vol. 6". Hachette Book Group. Retrieved December 21, 2017. ^ "BTOOOM！　7巻". Shinchosha (in Japanese). Archived from the original on August 3, 2015. Retrieved August 18, 2015. ^ "BTOOOM!, Vol. 7". Hachette Book Group. Retrieved December 21, 2017. ^ "BTOOOM！　8巻". Shinchosha (in Japanese). Archived from the original on August 14, 2015. Retrieved August 18, 2015. ^ "BTOOOM!, Vol. 8". Hachette Book Group. Retrieved December 21, 2017. ^ "BTOOOM！　9巻". Shinchosha (in Japanese). Archived from the original on August 3, 2015. Retrieved August 18, 2015. ^ "BTOOOM!, Vol. 9". Hachette Book Group. Retrieved December 21, 2017. ^ "BTOOOM！　10巻". Shinchosha (in Japanese). Archived from the original on August 14, 2015. Retrieved August 18, 2015. ^ "BTOOOM!, Vol. 10". Hachette Book Group. Retrieved December 21, 2017. ^ "BTOOOM！　11巻". Shinchosha (in Japanese). Archived from the original on August 14, 2015. Retrieved August 18, 2015. ^ "BTOOOM!, Vol. 11". Hachette Book Group. Retrieved December 21, 2017. ^ "BTOOOM！　12巻". Shinchosha (in Japanese). Archived from the original on August 14, 2015. Retrieved August 18, 2015. ^ "BTOOOM!, Vol. 12". Hachette Book Group. Retrieved December 21, 2017. ^ "BTOOOM！　13巻". Shinchosha (in Japanese). Archived from the original on August 14, 2015. Retrieved August 18, 2015. ^ "BTOOOM!, Vol. 13". Hachette Book Group. Retrieved December 21, 2017. ^ "BTOOOM！　14巻". Shinchosha (in Japanese). Archived from the original on August 14, 2015. Retrieved August 18, 2015. ^ "BTOOOM!, Vol. 14". Hachette Book Group. Retrieved December 21, 2017. ^ "BTOOOM！　15巻". Shinchosha (in Japanese). Archived from the original on August 14, 2015. Retrieved August 18, 2015. ^ "BTOOOM!, Vol. 15". Hachette Book Group. Retrieved December 21, 2017. ^ "BTOOOM！　16巻". Shinchosha (in Japanese). Archived from the original on August 11, 2015. Retrieved August 18, 2015. ^ "BTOOOM!, Vol. 16". Hachette Book Group. Retrieved December 21, 2017. ^ "BTOOOM！　17巻". Shinchosha (in Japanese). Archived from the original on August 3, 2015. Retrieved August 18, 2015. ^ "BTOOOM!, Vol. 17". Hachette Book Group. Retrieved December 21, 2017. ^ "BTOOOM！　18巻". Shinchosha (in Japanese). Archived from the original on September 16, 2015. Retrieved September 19, 2015. ^ "BTOOOM!, Vol. 18". Hachette Book Group. Retrieved December 21, 2017. ^ "BTOOOM！　19巻". Shinchosha (in Japanese). Retrieved February 29, 2016. ^ "BTOOOM!, Vol. 19". Hachette Book Group. Retrieved December 21, 2017. ^ "BTOOOM！　20巻". Shinchosha (in Japanese). Retrieved May 10, 2016. ^ "BTOOOM!, Vol. 20". Hachette Book Group. Retrieved December 21, 2017. ^ "BTOOOM！　21巻". Shinchosha (in Japanese). Retrieved September 15, 2016. ^ "BTOOOM!, Vol. 21". Hachette Book Group. Retrieved December 21, 2017. ^ "BTOOOM！　22巻". Shinchosha (in Japanese). Retrieved February 14, 2017. ^ "BTOOOM!, Vol. 22". Hachette Book Group. Retrieved December 21, 2017. ^ "BTOOOM！　23巻". Shinchosha (in Japanese). Retrieved July 28, 2017. ^ "BTOOOM!, Vol. 23". Hachette Book Group. Retrieved December 12, 2018. ^ "BTOOOM！　24巻". Shinchosha (in Japanese). Retrieved November 23, 2017. ^ "BTOOOM!, Vol. 24". Hachette Book Group. Retrieved December 12, 2018. ^ "BTOOOM！　25巻". Shinchosha (in Japanese). Retrieved June 12, 2018. ^ "BTOOOM!, Vol. 25". Hachette Book Group. Retrieved December 12, 2018. ^ "BTOOOM！　Light 友情編　26巻（完）". Shinchosha (in Japanese). Retrieved December 12, 2018. ^ "BTOOOM！　Dark 真実編　26巻（完）". Shinchosha (in Japanese). Retrieved December 12, 2018. ^ Titsoff, Ader (2017-04-05). "Btooom! Won't Get a 2nd Season as Mobile Game Flops". GoBoiano. Retrieved 2018-02-23. ^ "Jeu vidéo : l'antique « Bomberman » a-t-il inspiré les phénomènes « PUBG » et « Fortnite » ?". Le Monde (in French). 25 April 2018. Retrieved 18 February 2019. ^ Theron Martin, "Btooom! Episodes 1 - 7 Streaming", 'Anime News Network', Dec 09, 2012. Retrieved 2017-01-14. ^ "Series Data – Quick View". www.someanithing.com. Retrieved 2018-02-23.